We are very fortunate to have most of both sides of our families in state… actually most of them are all here in Cincinnati! But that means that the opportunity for overnight guests is rare. Really rare. So rare that we made our smallest bedroom into our guest room. We moved in when I was 7 months pregnant with O. In the moment, our logic was that we’d be in O’s room a ton, use a lot of floor space in her room (since kids usually play in the floor for 4+ years) and that guests were few and far between. That’s how the nursery landed in the larger room and the guest room got the short end of the stick. And since we moved in when I was in prime exhaustion mode of pregnancy (besides random spurts of nesting) the guest room housed a wall of unopened boxes of diapers I had pre-purchased while pregnant with an amazing system of coupons, points and Target gift card offers. Like we didn’t buy diapers until O was 9 months. THAT many diapers. But when O was just a few weeks old we got a call from our friend Molly. She was excited to tell us that she had a few job interviews lined up in the area and hoped to come see O. She also needed a place to crash. Cool. We had a place. But thats about it… I was embarrassed but I had to tell her our guest room was nonexistent but that she was more than welcome to stay if she was cool with the couch or an air mattress. Molly arrived the next week with her air mattress and belongings. She also arrived to a brand new baby, a new mommy with food poisoning and an overwhelmed new dad. Molly jumped in and picked up where we left off so I could get better and Hubby could reclaim his sanity. It was like heaven sent her or something. The next day she had a really good interview… so good that she was hired on the spot. She started the very next day. New predicament: Molly was moving back to Cincy. Like now. Lightbulb: She could live here until she finds a place. A month or two? We could do that for a friend. And it was the job of her dreams… she could rough it on a mattress until she found an apartment. We offered Molly the teeny tiny diaper storage room. Sure, it was “snug” and currently royal blue but she could have it if she wanted. We agreed on a friendly “rent” rate and before we knew it we had a roomie. Okay, you’re probably wondering if that was nuts. We just moved in and had a kid – our world was upside down… why on Earth would we put ourselves in this position to have another body under this roof? Were we out of our minds? Let me tell you something, where I come from you take care of each other. We had the means to help Molly stay so she could start the job of her dreams (no exaggeration) so why wouldn’t we try to help make that possible? So that’s what we did. But a funny thing happened. While we thought we were taking care of someone, she ended up taking care of us. Her “rent” gave us wiggle room in our budget while we got used to the unpredictable financials of caring for a baby (formula rivaled our car payment). Her presence allowed me to enjoy a full length shower without hurrying back to my child. She often babysat free of charge so we could enjoy a date night or even just an evening of grocery shopping together without hurrying home. Sometimes Molly was my shopping partner. This is a huge perk when you have been nowhere but your home or the doctor’s office for more than a month. I often came home to an empty dishwasher or a freshly vacuumed family room. It was working out so well that she stayed for more like 9 months. We were sad to see her go but she only moved 5 miles away and is still our go-to sitter. When Molly moved out, that teeny blue room was still teeny and very blue. And because it is the spare room it was neglected for quite some time. 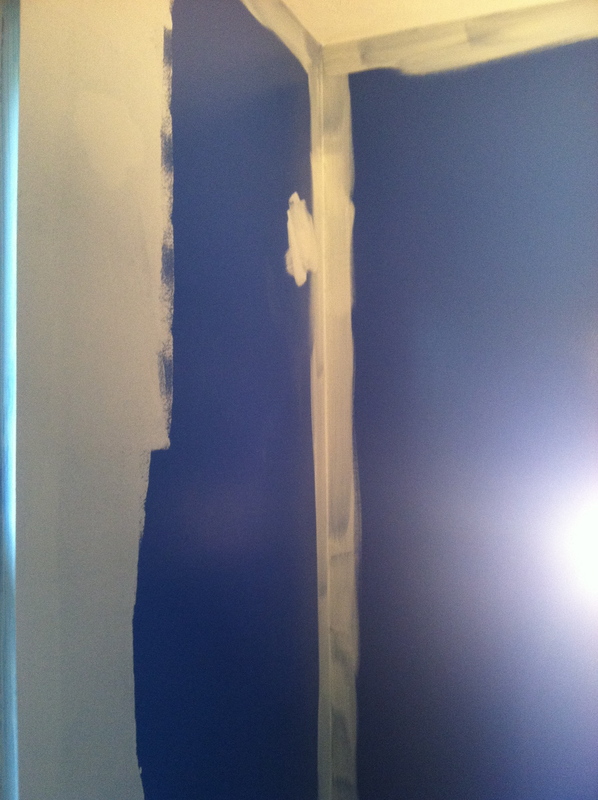 Eventually I mustered the motivation to prime that royal blue twice and then paint it Behr Zen green twice. That’s four coats of paint, people. Four. The photo above was taken as I was painting on the first coat of professional grade stain blocking primer. It sat painted with a desk and book shelf in it for months. When Hubby and I sold our souls bought a new mattress earlier this year and we squeezed our old one into the guest room. The room has slowly accumulated furniture like the curbside special sofa table. 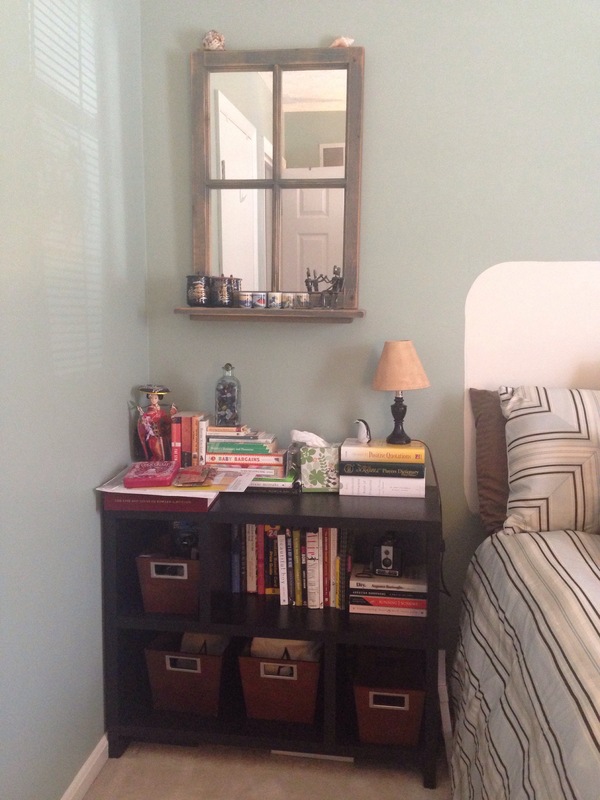 I hung mirrors and stocked the book shelf as time went by. We have our first real guests arriving next week. This prompted me to finally hang curtains. 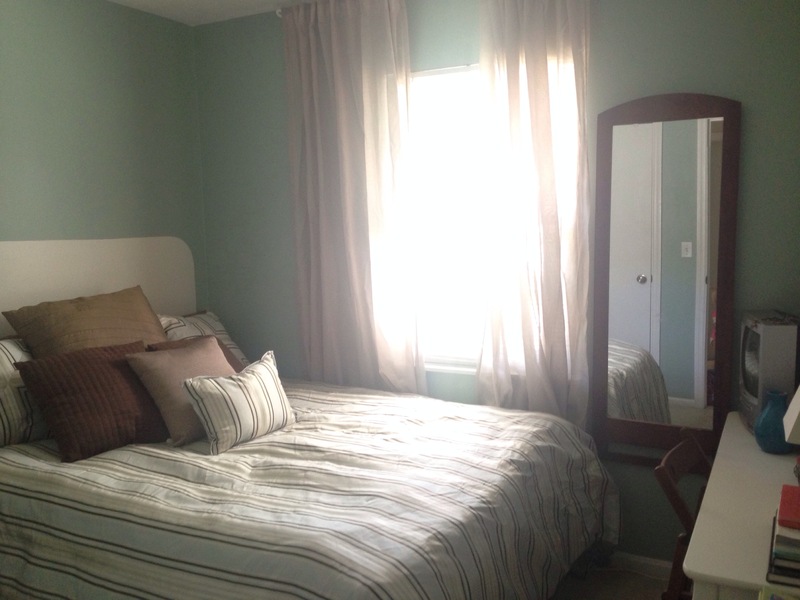 While I was frantically drilling I realized that the not-so-blue-anymore guest room needed a full reveal of its own. Ta-da! Here’s what I squeezed into a 10’x8′ room. I used my duvet set from my single days (that I love but Hubby doesn’t) to dress the bed. It was a complete cooincidence that it matched the walls so well. Then I hung tan Vivan curtains from Ikea over the window. The mirror to the right of the window was once a stand up mirror but there isn’t any floor space I was willing to use on it so I bolted it to the wall a few months ago. I hung it directly across from the door… I often use it when standing in the doorway or hall. I hadn’t thought anything of it until it was time to hang curtains. I was not negotiating its location. But I ended up hanging the rod off center and using the curtains over blank wall space as well as the window to give the illusion of having a bigger window. 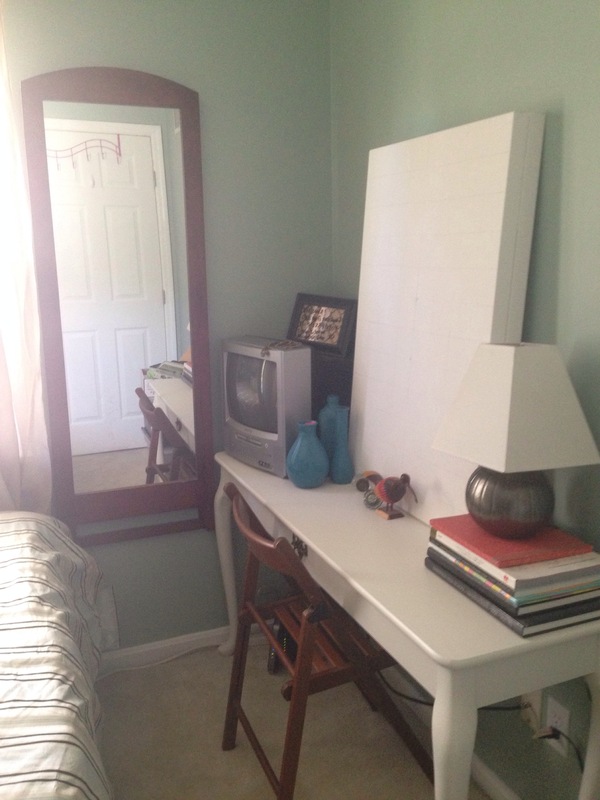 Here you can see that the sofa table is a desk, dressing table/vanity and a tv stand. In a small room, we needed multi-fuctional pieces. Unfinished canvases are stored here… I might have to hang something or finish one before our guests arrive. One of the thrifted lamps also resides on the sofa table. Another garage sale mirror hangs above the bookshelf. I wanted it to reflect even more light and I like that it mimics having another window in the room. My favorite books are in here as well as some work-in-progress photo collections. This is also where many of our gifts from our Japanese business associates belong. Many are fragile or just plain gorgeous so they are in here far, far away from babies and dogs. The wooden bins on the bookshelf have a few things our guests might need. One has towels. Another has washcloths. My favorite use for them: I’ve stashed sample size soaps, lotions, fresh toothbrushes, razors and more in case a guests were to forget something (or lose their luggage as I have before). My pride and joy is that head board. With no space and a modest budget, I had limited options. So I Pinterested around and discovered that painting a headboard design directly onto the wall is a thing. Once again, I used my friend B’s rejected sample paint pints. 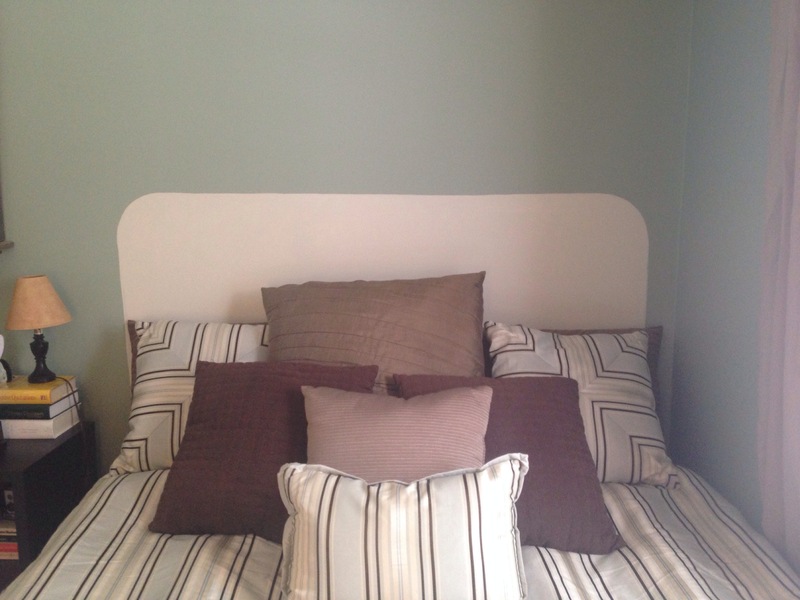 I chose the same color I used on the sofa table and made rounded edge headboard. Now it feels like a real bed… rather than our spare room with our old mattress. How do you like it? Anyone else paint a headboard onto the wall? I haven’t seen any others in person.